Photo: Shippen Manor, ca. 1755, Belvidere Road, Oxford, NJ. Listed on the National Register of Historic Places in 1984. Photographed by user:Art Charlton, 2010, (own work) [cc-by-3.0 (creativecommons.org/licenses/by/3.0)], via Wikimedia Commons, accessed April, 2013. Warren County Administrative Offices are located at 165 County Route 519 South, Belvidere NJ 07823; phone: 908-475-6500. Warren County was originally part of West Jersey. It was included in Hunterdon when that county was erected in 1713-1714 and remained part of it until Morris was set off in 1738-1739. It was a part of the territory of Sussex County when that county was erected in 1753 and so remained until the Legislative enactment of November 20, 1824, made a separate county of it. 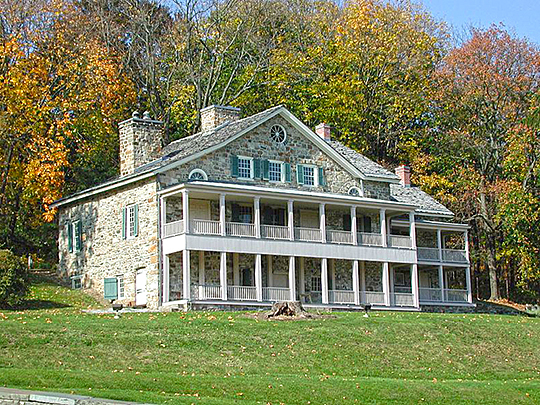 The first settlements were made along the Delaware River at what is now Philipsburg and Pahaquarry before the territory of West Jersey was organized into the county of Hunterdon. The townships of Warren County at time of its organization were Greenwich, Hardwick, Pahaquarry, Mansfield, Oxford, Knowlton and Independence. The first board of chosen freeholders met at Belvidere May 11th, 1825, and these townships were represented in it. Belvidere was selected by a vote of citizens of the county — taken April 19 and 20, 1825 — as the county seat. The grounds on which the public buildings are located were donated to the county by General Garrett D. Wall of Trenton by will dated June 7, 1825. The buildings were erected on the grounds thus donated in 1826 at a cost of about ten thousand dollars.